Food and mail is fine, but imagine a box full of jewellery being delivered to your doorstep every month. That’s exactly what Bling Bag does — jewellery subscription boxes! You can choose from the Mini Bling Bag or the Regular Bling Bag (that has handpicked pieces of jewellery in a potli bag), Outfit Stylers Bling Bag (you share photos of your outfit and they send you matching accessories), or even curate your own bag where you pick your favourites. 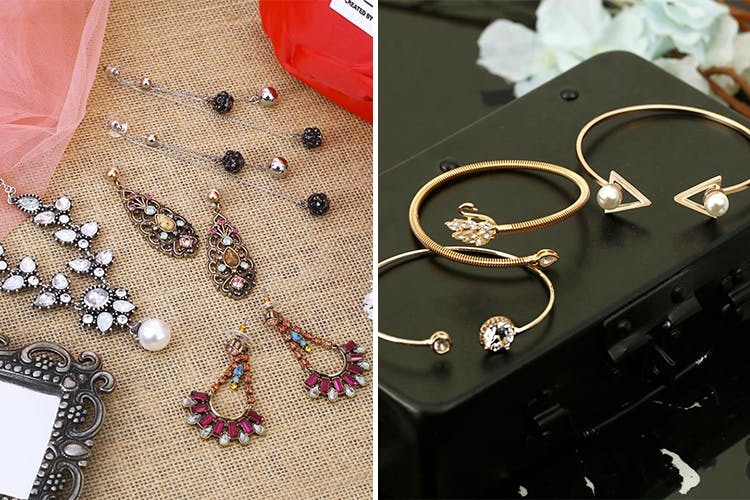 Apart from the boxes, you can pick up single pieces of jewellery like necklaces, bracelets, earrings, and rings. Collections include tribal designs, ethnic edits, 9-to-5 workwear, artsy pieces and even monochrome. So if you’ve got a BFF’s wedding coming up or you’re just looking to buy jewellery that you can wear anywhere from work to dinner with bae, these guys have got a range that’ll leave you spoiled for choice and coloured impressed!. There’s a lot of gold in the contemporary section, and if you’re not into gold jewellery, you might not be left with a lot of options. They've also got monthly themed subscription box that changes every month!